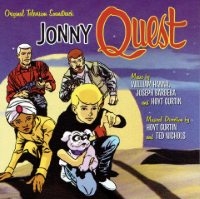 A licensed 2-CD limited edition collection containing original sountracks and cues from Jonny Quest; produced in 2016 by La La Land Records. 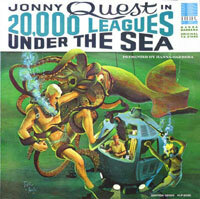 A 33 rpm LP from 1965 containing an untelevised Jonny Quest adventure. A 45 rpm "single" shortened version of the story on the LP. Although the cover is the same, this 45 rpm record contains music from various sources. "Shorty" Rogers version of Jonny Quest theme. This version of the theme song was found on the LP and 45s listed above. 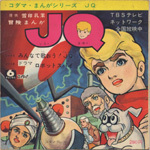 There were at least two "sonosheet" comics with records released in Japan in the 1960s. We have the retelling of "The Robot Spy."